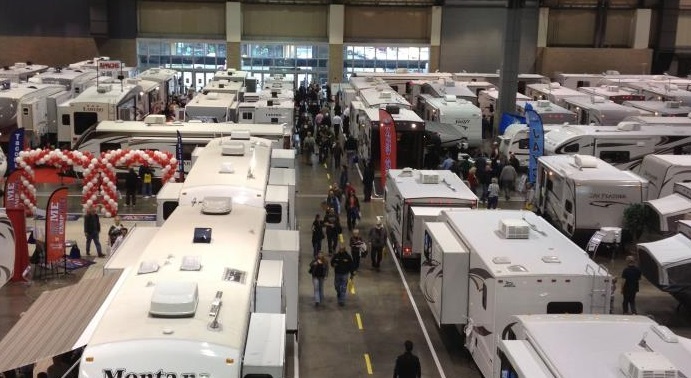 Previously we looked at 5 Important Things You Should Look For In An RV Show. 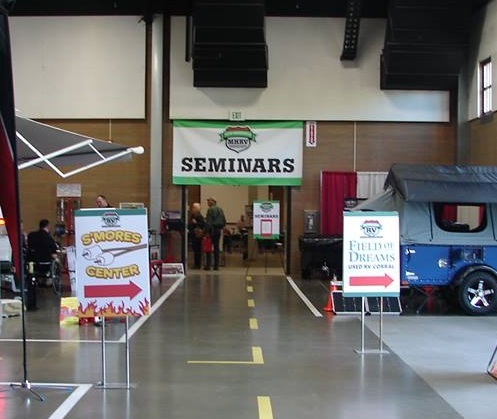 In this entry, we will look at getting the most out of your day at an RV show. Here are 5 tips to help you plan your visit. Visit the show’s website to see what activities and attractions are offered. Some things like seminars may only happen once a day. Are there certain brands or RV types that you are most interested in? Most shows will have a map on their website and a listing of dealers and products allowing you to identify where these items are in advance of your visit. 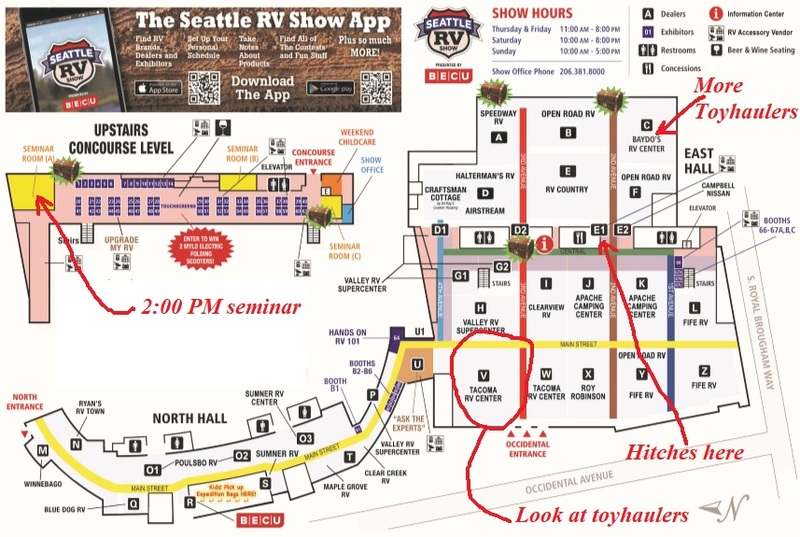 Print off the map and circle what products are where, where the seminars are located, and plot a route saving you time and energy when at the show. 2. If you are considering purchasing a towable RV (Travel Trailer, Fifth Wheel, Truck Camper) know in advance what your tow vehicle can safely tow/carry. Remember to allow for personal items, propane, batteries, and water when calculating how heavy of an RV you may consider purchasing. If you are looking at buying a motorized RV (Class A, B, C motorhome) and plan to tow a vehicle you already own as a dinghy, know in advance what the restrictions are (if any) of the vehicle you plan on towing. Once you know, you can plan on searching out the items you will need to tow it at the show. Items like tow bars, tow dollies, braking systems, and other items will likely be featured at the show. If your schedule allows, visit on a weekday. Many shows offer discount admission on at least one of the weekdays. If you must go during the weekend, Sunday is typically less busy than Saturday. If you must go on a Saturday, attend later in the day once the early crowd starts to dissipate and the parking stalls start freeing up. You are going to be exposed to a large amount of products and information at the show. Know in advance how you will record what you saw and heard. Many use their phones to take pictures of RVs they like along with the model number and specifications. Maybe you want to record the information by writing it down in a notebook. The advantage of a notebook is you can form a matrix allowing you to compare price, weight, features and other items in an easy-to-read format. Don’t forget to write down where you saw the item as you are likely to want to take a second look and it can get confusing to remember where you saw an item after looking at hundreds of other RVs in a large RV show. Regardless of the method you use, don’t rely on your memory as it will be in overload mode. If there is a brand you are particularly drawn to, make sure to seek out the manufacturer representative for that product to ask about any specific questions or concerns you may have. They typically have more product knowledge than the dealer’s salespeople who represent multiple product lines. Manufacturer reps are likely to know about new models coming out, interior color options, and what modifications can and can’t be made to a factory order unit to meet your needs. I hope this helps you make the most of your visit to an RV show and leads to many adventures in RVing!